Well we've got more news coming from Six Flag Great America today. It isn't official but it does speak volumes about what the park has in mind for the 2014 season and their newest construction project. Rumor has it American Eagle may be up for an Rocky Mountain Coasters refurbishment. They are the well known builders of Wood/Steal hybrid coasters such as Iron Rattler and New Texas Giant. However, what is odd is that American Eagle is a Racing Wooden Coaster. It has both a Blue and a Red side. 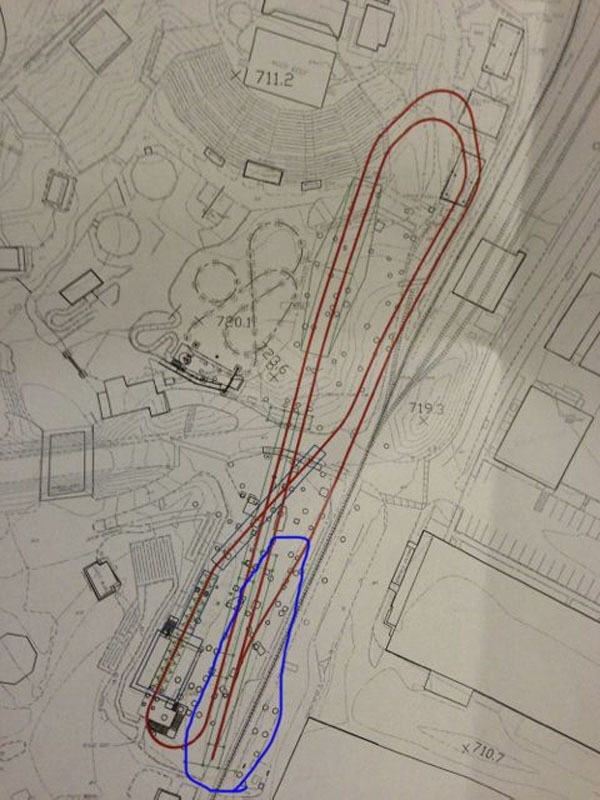 Rumor states that RMC will be re-building and re-tracking the blue side of the ride but no word on the red side yet. I'm not entirely sure how this will work considering this is a racing coaster, could one side be going steel while the other remains wood? That would be a new trick for Rocky Mountain Coasters to accomplish. InSanity lurks Inside will keep updating as more information becomes available as well as when the park decides to do their reveal of what the plan is for 2014 and American Eagle! Six Flags Great America Announces Goliath- Worlds Tallest, Fastest and Steepest Wooden Coaster! Well is Screamscape is to be believed, the new coaster coming in 2014 will be wood and built by Rocky Mountain Coasters. One person there reported from somekind of meeting saying the ride will be 165 feet tall with a 13 foot drop underground, making the first drop a total of 178 feet. While this won't break a record for height, it's still remotely possible they could go for speed. They are also reporting a weird 'track element' of the ride, something that could possibly be an inversion with a boost launch involved. It's the blue circled portion of the blueprints. It looks like the rumors around American Eagle being the "New Coaster" for the 2014 season isn't true. Apparently the pictures have been faked (Gee Folks, you might have said so rather then name-calling cause that's really mature). Sources aren't exactly sure if that project is for 2014 or some others season. Which leaves the question of "What is the 2014 New Coaster"? We've got some more rumor news about the 2014 project for Six Flags Great America. Rumor has it that the "New Coaster" for 2014 will be wooden and that the park may be after some kind of record breaker. It may or may not be 'speed" which they are after, which brings in a host of problems. According to a meeting docket we found posted at Screamscape, the coaster may be 165 feet tall and in the location of the former "Iron Wolf". For that blue circle I wanna guess a half loop than a twist to turn it back right side up.